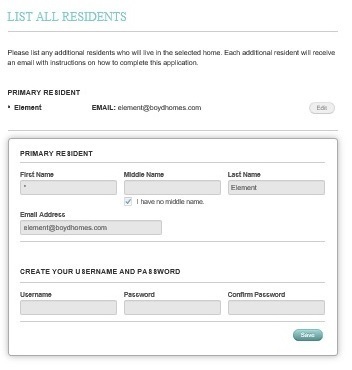 How to Apply for Your New Home at Element! Congrats on making the decision to apply for your new home at Element! Let’s get started! Step 1: Go to www.liveatelement.com. 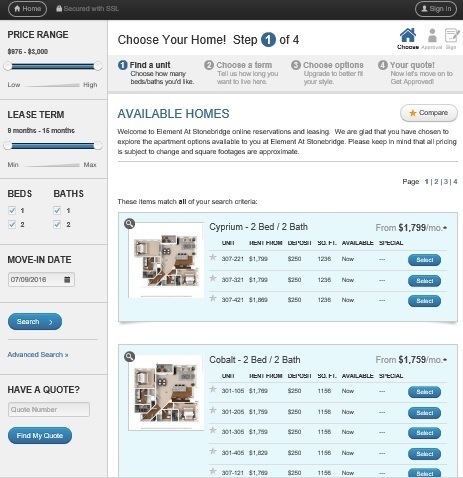 Step 2: At the top of the page, click on the Floor Plans tab. This will direct you to the page where you can search for your next home! Handy tip: On the left hand side of the screen, you’ll see the option to filter your search results based on move-in date, rent budget, etc. If you've already received a quote from us, you can also type it in at the bottom of this screen to find that quote! 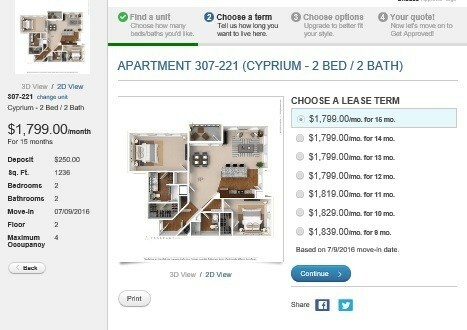 Step 3: After you’ve decided which floor plan you see yourself living in, pick your new address and click "Select"! 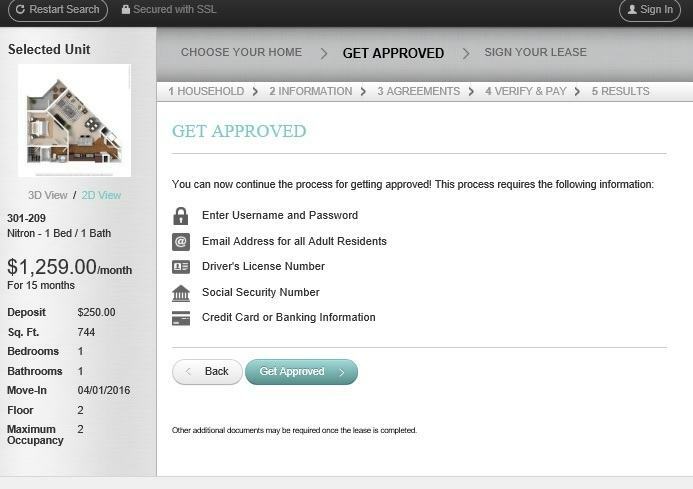 Step 4: This will open up the Lease Terms screen, where you can choose which rent amount and lease term fits you! 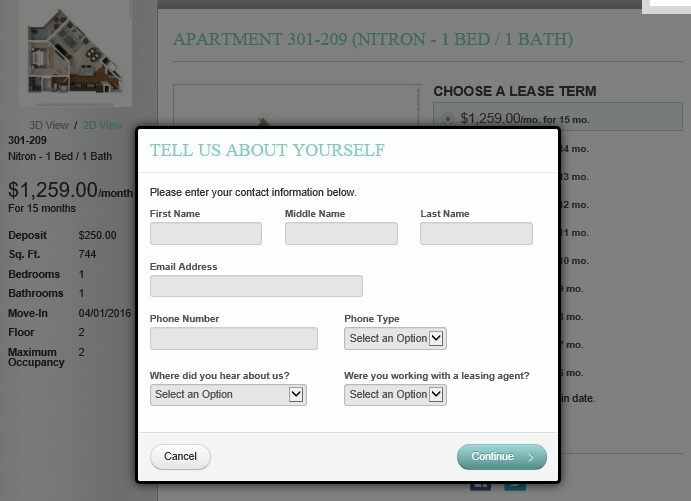 Step 5: Once you’ve chosen your lease terms, click “Continue”. This will bring you to the “Tell Us About Yourself” section. Filling out this section will generate a quote for you. What’s a quote? Great question! A quote locks in that rent rate for 48 hours! 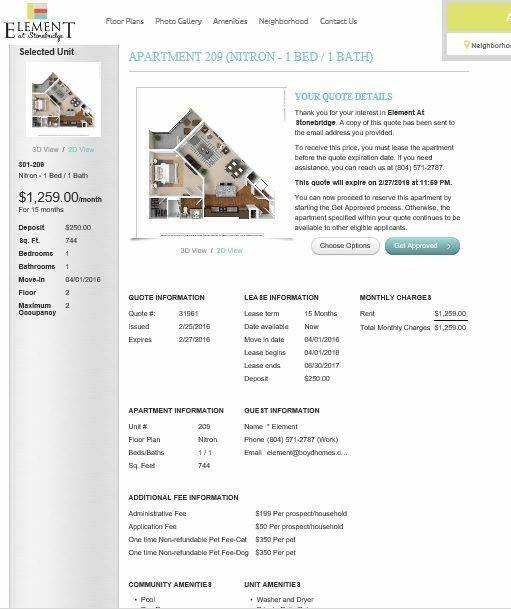 If you wait to apply and the quote expires, the rent rate could change. Also important to note, that apartment is still up for grabs for anyone else who wants to rent. Helpful hint: Have you been working with a leasing consultant? Be sure to find their name in the dropdown menu at the end of the form above. If you haven’t talked to any consultants, you can choose “House”, and one of our leasing consultants will be in touch! 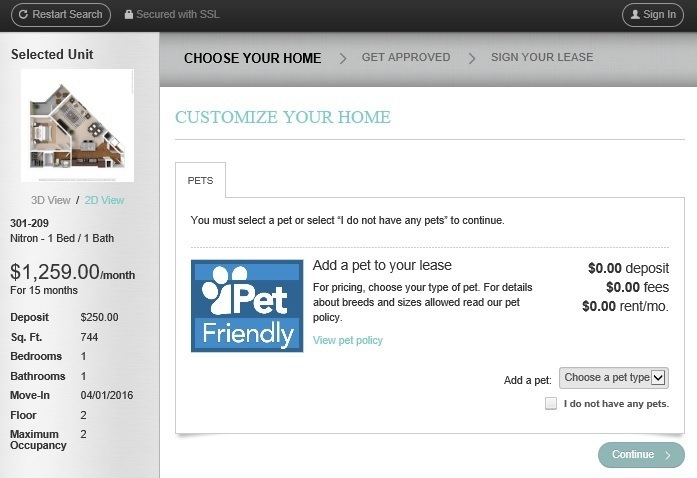 Step 6: Once you click continue, the system will ask you if you have pets. We are a pet-friendly community, so Fido and Fifi are welcome! If you have pets, please answer the question accordingly. If you don’t, just click “I don’t have any pets” and click “Continue”. 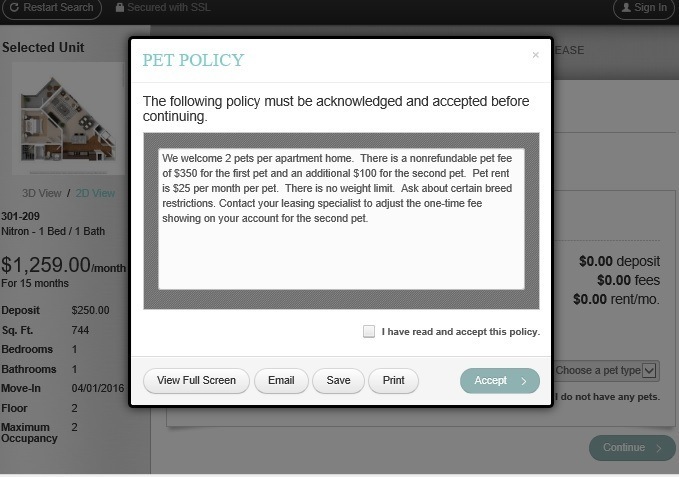 Regardless of if you have a pet or not, you will be asked to acknowledge the pet policy. Because, who knows, maybe you’ll adopt a new furry friend during your lease term, and now you know what that entails! Once you’ve read through it, check that you agree and click “Continue”. Step 7: Congrats, you now have the quote for your new home! It’ll look like this. But you’re not done yet. Want to wait and think about it overnight? Totally cool! But don’t forget that the quote expires after 48 hours and that that address is still available for anyone else to rent. But say you’re super excited and want to apply for your new home NOW! Go for it! 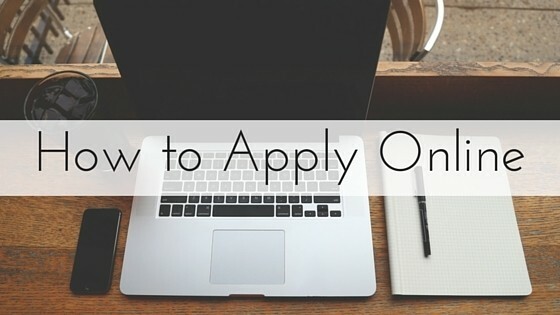 Step 8: So, let’s start the application process! On your quote, click “Get Approved”. This will open a screen that will tell you all the information that you will need in the next few steps. If you haven’t gathered all that info, now would be a good time so that the application process goes smoothly. 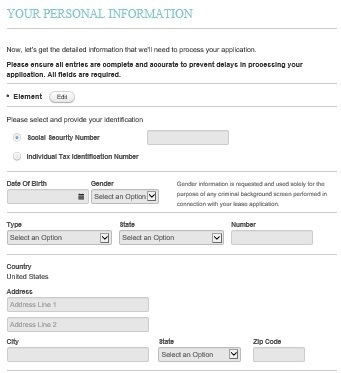 Step 9: On the next screen, you’ll be asked to fill in your information in the Primary Resident section. Once filled in, click “Save”. If there are additional residents over the age of 18, they will need to fill out the next section. If there are no additional residents, or if the other residents are minors, you’ll need to utilize the dropdown menu and choose accordingly. Once you’ve filled out this section, click “Continue”. Step 10: The next page will ask you to fill out your personal identification information. You’ll also be asked to provide your income information and to answer two questions. Once you’ve finished this part of the process, you can click “Save & Continue”. If there is another resident (over the age of 18), they will be asked to fill out the same information. Step 11: Almost done, we promise! The next section is the Agreements Section. Each applicant must read and accept these agreements. Depending on the software on your computer, you may be able to see the documents in the window. If you are unable to see them there, you can view them full screen, or save and print so that you are able to read them. 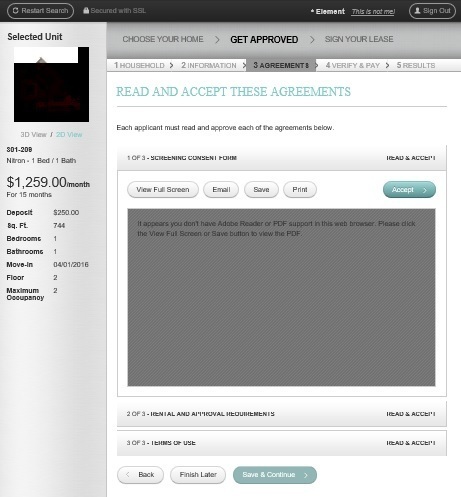 Once you’ve read them, accept the agreement by clicking “Accept” in the top right corner of each document. Then click “Save & Continue”. Step 12: The last step is to verify all the information you’ve put in and to make the payment for your application fees ($50/person over the age of 18) and the application deposit ($250, which will be applied towards your security deposit upon approval and move-in). 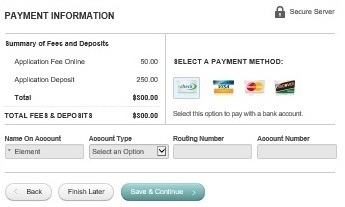 Once you fill in your payment information and verify all of your information is correct, you can click “Save & Continue”. This will begin the screening process and you’re set! Typically, your results will be emailed very shortly after. The leasing team will then be in contact! So what are you waiting for? Head on over to www.liveatelement.com and get yourself a new address!